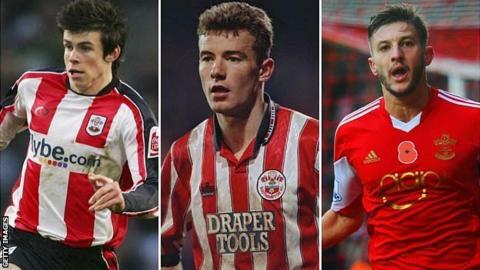 Southampton's record of developing young players makes them a "model" that other English clubs could follow, says former England captain Alan Shearer. Real Madrid's Gareth Bale and Arsenal's Theo Walcott followed Shearer through the club's academy as did Adam Lallana, who made his England debut last week. "How can Southampton carry on churning out players whereas big clubs have struggled to do that?" asked Shearer. "The answer, probably, is that they are giving their kids a chance." Playing time for English under-21 players in the Premier League reached a new low last season, and Football Association chairman Greg Dyke is open to the exploration of a quota system for foreign players. Although England qualified for next year's World Cup in Brazil by finishing top of their group, back-to-back friendly defeats by Chile and Germany have reignited the debate about the quality of players at national manager Roy Hodgson's disposal. Shearer, who scored 43 goals for Southampton between 1988 and 1992, praised Saints for playing the likes of midfielder Lallana, 25, and England Under-21 internationals Luke Shaw, 18, and James Ward-Prowse, 19. The trio have helped the club into third place in the Premier League, their best start to a top-flight season, under Argentine manager Mauricio Pochettino. "It's refreshing that they are continuing to produce youngsters at an academy that has worked wonders over the years," said Shearer, 43. "The money that football club has made out of their youth academy, it's a model for everyone to look at." The BBC Match of the Day pundit said "one of the reasons" he chose to join Southampton as a schoolboy in 1986 was they have "always given players a chance". "That started with Danny Wallace, Steve Williams, Matt Le Tissier, myself, Rod Wallace, Bale, Alex Oxlade-Chamberlain, Walcott - and the guys coming through now like Lallana, Shaw and Ward-Prowse," he added. "That hasn't just happened this season, it's been happening for years. It's incredible and a model that a lot of people should look at." The Premier League is attempting to give English youngsters more opportunities through its £320m Elite Player Performance Plan (EPPP), where academies have been graded and more coaches recruited to help improve standards. Shearer, who scored 30 goals in 63 England appearances, added: "It's an argument that youngsters are probably not getting a chance at bigger clubs because of the huge demand for success so they try and go out and buy it. "I know plans are in place to try and correct that through the EPPP but Southampton have been doing that for years and years."